Starting in Hall 2, we begin our tour of the museum's collection of Romanesque sculpture, which can be divided into two parts. One includes sculpture that is linked to monumental architecture, the best example of which is the relief by the Master of Cabestany. The other part consists of sculptural units used to decorate the interior of churches. These works focused mainly on the themes of the Virgin and Child, crucifixions and calvary that were located in significant spots such as the altar. This piece, by an anonymous artist known as the Master of Cabestany, is the most important work in the entire museum. The artist created sculptures of great quality, working in such places as Tuscany, Languedoc, Catalonia and Navarre throughout the second half of the 12th century. This relief comes from the western portal of the Benedictine monastery of Sant Pere de Rodes in Girona. Carved in the late 12th century, between 1150 and 1175, it is one of the most notable pieces by this artist and his workshop. This block of marble seems to have been re-used, as indicated by the sculptural traces that can be made out on the back of the piece. 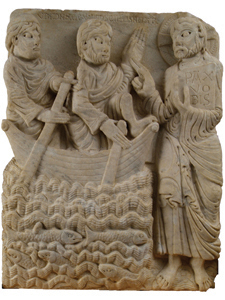 The scene represented here is the Appearance of Jesus to his Disciples at Sea, as confirmed by the inscription found on the upper part of the relief. Jesus stands upon the water while blessing his apostles. The position of Saint Peter's left foot seems to suggest that he is getting out of the boat, while Saint Andrew holds onto an oar. The lower part of the relief shows the sea with its dynamic waves and fish. The style is bold and expressive. The artistic personality of this master is marked by the influence of the classical world, as shown by his use of the trephine and the strong expressionist feeling found in the exaggerated dimensions of his figures' hands, the angular treatment of their faces and their almond-shaped eyes. When the monastery was abandoned in the late 18th century, the church's portal was almost completely destroyed; many sections of it were acquired by private collectors. This relief, which is the only scene from the portal that has been conserved whole and remains in perfect condition, was acquired by public subscription by the "Friends of Catalonian Museums" and donated to the Frederic Marès Museum in 1960. As you continue, notice the two other sculptural fragments from the portal of the same church, which are on view to the left.